Zombieland 2 is officially kicking off production in January and director Ruben Fleischer is just as excited as everyone else is about it. The original Zombieland came out nine years ago and, though it did well at the time, it didn't do quite well enough for Sony to greenlight a sequel, despite quite a bit of desire from the creative team to get one going. Now, finally, the follow-up is gearing up to begin filming early next year so that it can arrive in theaters in time for the first movie's tenth anniversary. Ruben Fleischer is returning to the director's chair. The filmmaker is currently promoting his latest movie, Venom, which stars Tom Hardy as the Marvel Comics character. 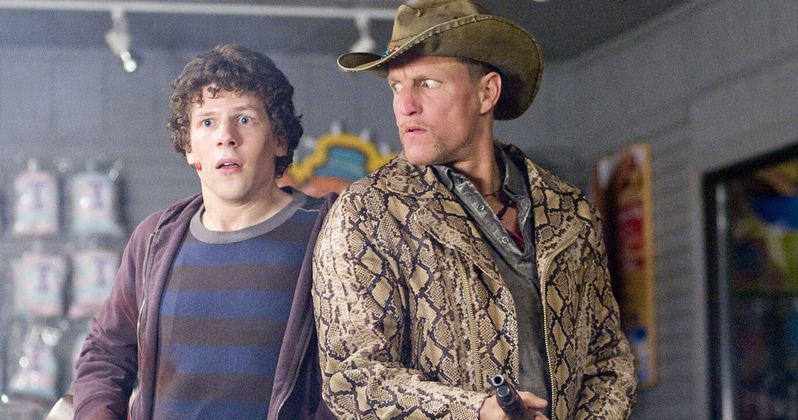 During a recent interview, Fleischer was asked about the status of Zombieland 2 and, at this stage, he obviously can't say too much, but the director shared his excitement and explained that he's already doing prep work behind the scenes. Here's what he had to say about it. "I'm thrilled. We're already actually starting Zombieland. I've been scouting and storyboarding and getting it going, and to get to work with that cast again is just an absolute dream come true. It's been really exciting starting to think about that movie, and to get to work with Emma, Jesse, Woody and Abigail once again is truly a dream come true. Yeah, we're just at the very early stages, but we have an amazing script, and we're going to start shooting in Georgia in January." Paul Wernick and Rhett Reese, who have since gone on to work on both of the Deadpool movies, penned the screenplay for both the original and the sequel. They've become big names in recent years and that surely didn't hurt anything when it came to getting Zombieland 2 the green light. One complication has been getting Emma Stone, Jesse Eisenberg, Woody Harrelson and Abigail Breslin's schedules to all line up, as they're all big stars with a lot of projects going on. Luckily, they've finally managed to sort that all out. It's certainly a case of better late than never. And all of that time passing may actually make the sequel more interesting. Ruben Fleischer is staying somewhat tight-lipped, but he teases that the world might look pretty interesting a decade after the zombie apocalypse first hits. "Yeah. I mean, it's been 10 years, so who knows what the world will look like at this point?" Sony has yet to release an official synopsis or story details, but it's rumored that the sequel will see the gang taking on hordes of super zombies that are far more difficult to deal with. But the real question; how are they possibly going to top that Bill Murray cameo? We'll have to wait and see for ourselves when Zombieland 2 hits theaters on October 11, 2019. For more with director Ruben Fleischer, you can check out the full interview over at Fandango.